If you love your Pilates class in the gym but want to practice it privately at home to save time and money, you should invest in at least one piece of Pilates equipment. While a reformer is probably the most effective, it isn’t cheap and it takes up a lot of floor space and even storage space. That’s why you might want to consider the best Pilates chair for home use. You can get a very good one for most budgets and most will fit in even the smallest apartment. It is more effective than doing regular mat Pilates because it does provide a resistance system that helps strengthen your limbs and core. It can even provide a good amount of cardio exercise. A Pilates chair comes with or without sculpting handles and its single or dual pedals work on a spring system that you work on using your arms or your legs while standing, sitting or lying down on the seat or standing on the pedal/s. Don’t worry about beginner, moderate or advanced levels because the chair springs should be adjustable for resistance. If you think you have the space and budget for a Pilates reformer instead, here are the best ones for home use. A happy medium would be a Toning Tower. While some Pilates chairs are especially designed for home use and are light and foldable, many Pilates enthusiasts spring for a more expensive studio brand because they aren’t too big for the home either. 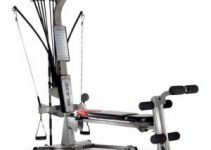 If you want the sturdiest Pilates equipment for the home and the cost is not a factor, we’ll give you a couple professional options to choose from along with more affordable models. The professional models are better suited for very overweight users. Whichever one you choose, it has to be sturdy and safe and allow a variety of exercises to be performed on it. The pedals should be easy to reach for your height and comfortable to use. The seat should also be comfortable and large enough to allow you to balance on even for lying down workouts. The range of resistance offered should be enough to take you from beginner to advanced levels over a period of time and adjusting resistance between exercises should be quick and easy. Throughout the workout the Pilates chair demands your complete attention because you have to control the movement of the pedals against the springs and not the other way around. This helps you get a more focused and effective workout. While doing the exercises, your body alignment and posture is improved because you have to perform the exercises in a small space. You may find that your overall balance and back health improves. Anyone with knee problems will find that you can get a great low impact workout without further damaging them or any other joints. You can get a lot of variety with chair Pilates because there are exercises for your legs, arms and core, and you can do slow and controlled exercises and switch to sharp and quick ones and back. Whether you’re toning your muscles or getting your heart rate up, there’s less chance of you getting bored on it. Absolute beginners, pregnant women, the elderly and those recovering from surgery or illness can do the easiest recommended exercise, like sitting on the chair and slowly pushing down on the pedal with the feet. The Pilates PRO Chair is the most accessible and affordable pilates chair for beginners to Pilates, but it is also an excellent option for fitness experts and enthusiasts, thanks to the multiple resistance options. There are two settings with an adjustable spring, a basic light setting for beginners and a higher resistance option for the fitter individuals out there who need a bigger challenge. The overall construction is pretty sturdy, with a steel frame and colorful vinyl padded seat. The chair is available in six vibrant colors. On the whole, the Pilates PRO feels quite rugged and stable on the floor. It has a 300 lbs weight capacity and doesn’t feel wobbly even when you put your entire weight on the pedals. Talking about the pedals, this chair has a split pedal system. This makes the chair more versatile, as you can perform a wider range of motions using both your feet and arms separately. As this is a basic model, it does not come with any handles. But the manufacturer does have another model with handles, which is also part of this review list. It is right below this review. Another highly appreciated feature on this chair is its compact size and collapsible design. It weighs 33 lbs and at 25″ x 31″ x 23″, it doesn’t take up a lot of space at full size. But if you want to stow it away under a bed or in the closet after use, the collapsible feature does come in handy. It can be dismantled and put back together in a matter of minutes. The Pilates Pro chair is delivered in an almost fully assembled condition, securely packaged and wrapped. Initial assembly is quite simple and can be finished in under 15 minutes tops. In fact, you will probably need more time to peel off the multiple layers of plastic this chair is delivered under. Many users have cited this as a minor inconvenience even! The movement of the different parts of the chair is fairly smooth for most users. While your weight may not be a major factor (under 300lbs), taller people (above 6’4″) with long limbs may find the pedals slightly awkward to use. The Achilles Heel of the Pilates PRO chair has to be its spring. After all, it has to bear the brunt of all pressure applied to this thing. There are some issues related to squeaking noises, which can develop with constant and heavy use. The springs on a few chairs also tend to break down pretty fast. But on the whole, the Pilates Pro Chair reviews indicate that users find it easy to use and effective across all ages and even for seniors. Many users were extremely satisfied with the set of four instructional DVDs the company has added to the package. There were some indications that the product is a tad overpriced, but considering that this is the cheapest offering out there, that shouldn’t really be a deterrent. The Pilates PRO Chair Max with Sculpting Handles is almost identical to its basic variant from Life’s A Beach, save for an extra set of handles and a concurrent increase in the price. Yes, you get the same stainless steel frame, with colorful pads for comfort and support. And you can buy them in half a dozen color options as well. The Pro Chair Max is basically a Pilates Pro Chair (reviewed above), with a pair of extra handles strapped on board. And you also get a pair of extra instructional DVDs along with it, bringing the total number of discs to six. The handles allow you to perform a whole range of new workouts. These include advanced exercises, some of which can only be performed with the said handles. Called “Sculpting Handles,” these can help you focus on several core areas like your thighs and glutes. Other than that, everything else is identical between the Pilates Chair Pro and the Chair Pro Max. It can be assembled easily, has the same compact form factor, and can be easily folded up as well well. Also, in the Pro Chair Max, you will have to remove the handles if you want to fold the chair for storage. Beyond the issues related to the basic Pilates PRO chair, the Max version has one disadvantage that springs to mind immediately: In a perfect world, the company would have sold those Sculpting Handles as an accessory to the basic chair. But here, you have to buy an entire chair to get the additional features. If you already own a Pilates Pro, Chair, this would be a minor bummer. Other than that, this is an excellent choice for folks who are starting to improve their pilates skills. Designed by famous Pilates instructor Carroll Krief, the Malibu Pilates Chair ticks all the right boxes as far as functionality and versatility are concerned. In many ways, it resembles the Pilates Pro from Life’s A Beach. But not in price, as Malibu is a more premium package that retails at nearly twice the price of the other chair. The chair is a combination of durable steel and vinyl padding. The padding is only available in black, though that is not necessarily a significant flaw. The chair has a split step pedal system, the benefits of which have already been explained. 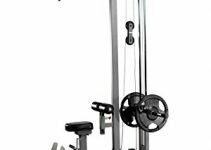 The system is operated by a pair of adjustable springs, which allow you to change the resistance levels for your workouts. The difference in resistance is not immense, but it is well worth it if you are a beginner slowly building up your stamina levels. With dimensions of around 30″ x 25″ x 22″ approximately, the Malibu Pilates chair is also very compact and space saving. It can also be folded up for easy storage, like many other similar products. This is a standard model, and it doesn’t have several advanced features like extra handles other than the small side ones. But there is a Pro version, which has been reviewed below. Overall, the chair is pretty stable and can hold a maximum weight of 300 lbs. It is comfortable to use for most folks, except probably those under 100 lbs and closer to the weight limit. The spring movements are largely smooth, but some products have been known to have defective springs that malfunction. Replacement springs are available on eBay. Some notable cons involve the spring quality and durability, along with value for money aspect. However, you can get a used but almost new one for much less via Amazon. As is quite evident from the title, this is the advanced version of the Malibu Pilates Chair. The Malibu Pilates Pro Chair version is aimed squarely at more experienced Pilates practitioners and comes with several advanced features over the base variant. You get a pair of sculpting handles, which are useful for performing advanced workouts and targeting specific muscle groups. With these handles, this chair can handle pretty much any pilates exercise out there with ease. Another standout feature is the availability of two different pairs of resistance springs. The basic chair only has one pair, with standard resistance aimed at beginners. But the Pro version also has an additional set of heavy duty springs which should make things interesting for seasoned veterans with a well-developed core. Plus, you also get more exercise DVDs, the Pro package having seven discs as opposed to the three you get with the basic package. You can try out nine different workout programs using these DVDs. Everything else is identical to the standard Malibu Pilates Chair, right down to the design, build quality, features and weight rating. If you are looking for advanced resistance settings and sculpting handles, this is the Malibu Pilates chair for you. The compact chairs are all great in their own right, but they are also a bit limited as far as resistance settings are considered. And sometimes, you could do with a bit more room on the chair, for comfort and confidence. The Balanced Body Single Pedal EXO Chair is an economical, lightweight and stackable model from the makers of the Wunda Chair and it addresses both these issues, with a slightly larger size than the cheaper ones above and a wide range of adjustable resistance settings to choose from. This is the basic version with a single pedal and no handles. In fact, the EXO range from Balanced Body does not have handles. If you want that feature, you will need to look at their Combo Chair range. With measurements of 24″ x 29″ x 23″ this is still a quite compact chair. It may not fold and fit into tight corners, but it still doesn’t take up too much space in your home. And at a shade under 40lbs, it is also very lightweight and easy to lug around. One of the most popular aspects of the EXO chair is the adjustable resistance. While smaller, cheaper chairs make do with two or three sets at best, here you can program and choose from over eight different resistance settings. The company also sells a wide range of functional resistance kits separately, like heavy or light resistance bands for arm work. So there is a lot of versatility on offer here. The chair comes fully assembled and does not require any further steps for installation. The resistance adjustment features are intuitive and easy to use. The build quality is top notch, and this is one of the most stable pilates chairs out there. This chair functions smoothly and silently. The lack of split pedals and handles do reduce the functionality of this particular pilates chair. And it is also rather expensive, But you do get the reliability and quality that you pay for, and this chair is a great option for seniors, invalids undergoing therapy, and beginners who are still learning the basics of Pilates. This is the Split-Pedal version of the Exo Chair reviewed above. It is virtually identical to the latter model in all other regards, except for the price and the dual pedals. Both chairs have the identical build quality and features. The padding is comfortable and slip-free on both of them. The resistance setting is also identical, with the option to add other resistance kits. The Split Pedal on this chair comes with a dowel. This is a great feature that can be used to transform the chair into a single pedal version when you require. And if you want to use the split pedals for advanced reciprocal and rotational movements, all you need to do is remove the dowel. If you want a bit more workout options, the Split-Pedal EXO Chair is a decent choice. But this series still lacks handles, and that does detract from the overall value of this product, especially when you consider the steep price. But still, the EXO chair is great for Pilates beginners and intermediate level users, and in that respect, this chair really does shine. You can also add some of the best Pilates accessories from the same company to elevate its usefulness. Costing nearly eight times as much as the cheapest chair on this list, this Stott Pilates Split-Pedal Stability Chair is a truly high-end product. But it also has a long list of features to justify that kind of price tag. As far as looks are concerned, this is one of the most confidence-inspiring designs out there in this category. The base looks extra solid with metal extensions bolted to the main cage. It weighs 70 lbs, which is much more than most other chairs out there. So you can rest assured about the stability and solidity of this pilates chair. And another great feature is the roll-on wheels on the base, which go a long way in mitigating the lack of portability because of the heavy-duty construction. This is a split-pedal chair so that you can perform a full range of pilates workouts using both your feet and arms. If yo prefer to use them as a single pedal, then they can be easily locked together. 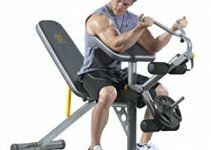 It does not have handles though, so you should look at the next model from the same manufacturer if you want to perform more advanced workouts. The chair comes with different sets of springs for resistance adjustments. There are heavy and light springs, along with an additional set of hook-on adjustments to bring the overall choice to more than 5. And the chair is still very compact and easy to store, measuring just 21.6 x 31.5 x 24.5 inches. The user experience is premium, with smooth motion and zero noise complaints, which is the least you should expect for such a premium product. The Stott Pilates Chair is ideal for people of different heights and weights and works well in a home, gym, or studio. The only thing holding this one back is its price tag. The Merrithew Split-Pedal Stability Chair with Handles is pretty much the same device as the above Pilates chair from Stott Pilates. As is common among pilates chair manufacturers, they have decided to release two chairs, one with the basic feature list, another one with an additional handle for a more extensive range of motions. This model has one of the most advanced handles found on pilates chairs out there. These are adjustable handles which can be easily removed from the chair if necessary. These inverted L-shaped handles can be used for performing various exercises including lunges and dips. Everything else is identical to the basic chair, and you also get instructional DVD with this one. 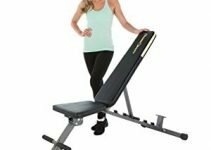 The price difference between the two models is not significant, which makes this Pilates Chair the more attractive option out of the two.